Good interview. I actually read the Madonnas book for my book club at work a few months ago. I thought it was very interesting although I seem to remember wishing that it had had more detail about the siege which is something I’m really interested in. Thanks! I haven’t read the Madonnas; I don’t particularly want to, as my grandmother died of complications from Alzheimer’s. Reading it would most likely turn me into an emotional wreck for a few hours. 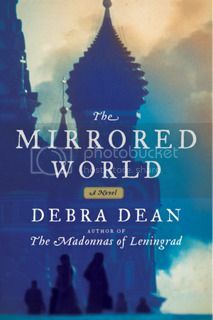 I loved The Mirrored World; it was a neat exploration of an earlier period of Russian history than I normally study, and it was fascinating to see Xenia’s descent into madness and sainthood. The Siege of Leningrad is both interesting and horribly depressing. We went to the Blockade Museum when I studied in St. Petersburg, and it was one of the most memorable excursions of the entire trip. When we went into the building, everyone was joking around and laughing like normal college students. By the time we left, all of us were silent. It’s a rather heavy subject, and I’m surprised that it isn’t more widely studied in the States. It’s definitely ‘heavy’ but at the same time one of those periods in history that makes for compelling reading. I haven’t been to St Petersburg but it’s on my list! She is right that Russia has amazing stories.